1883-According to Mayor Ed Glennan, a Mardi Gras celebration was held in Biloxi in 1883. What is considered to be the first Mardi Gras celebration at Biloxi occurred on March 3, 1908. John Carraway(1873-1931), King Bienville I, and Blanche Picard (1887-1930+), his Queen, was the daughter of Bernard Picard (1853-1896) and Sarah Levy Picard (1859-1927). Bernard Picard was born in Alsace, France. Mr. Picard came to Biloxi circa 1889, and was the proprietor of Picard's Emporium, a dry goods store, located in the Eistetter Building on Howard Avenue at Magnolia Street. He expired on May 23, 1896, of stomach cancer at his 128 Main Street residence. His corporal remains were interred at New Orleans. (The Biloxi Herald, May 23, 1896, p. 8). Jules D’Aquin (1877-1936) and Ellen J. Joullian [m. Byron P. Lyons]. Their court: King Aurguis I; W.S. McIntyre; W.J. Thomas; W.H. Hunt; P.H. Prieur; John F. Eistetter; and Charles M. Lanius. John J. Kennedy (1875-1949), Mayor of Biloxi, and Augusta Coulter (1893-1980) ruled the Biloxi Mardi Gras on February 17th. 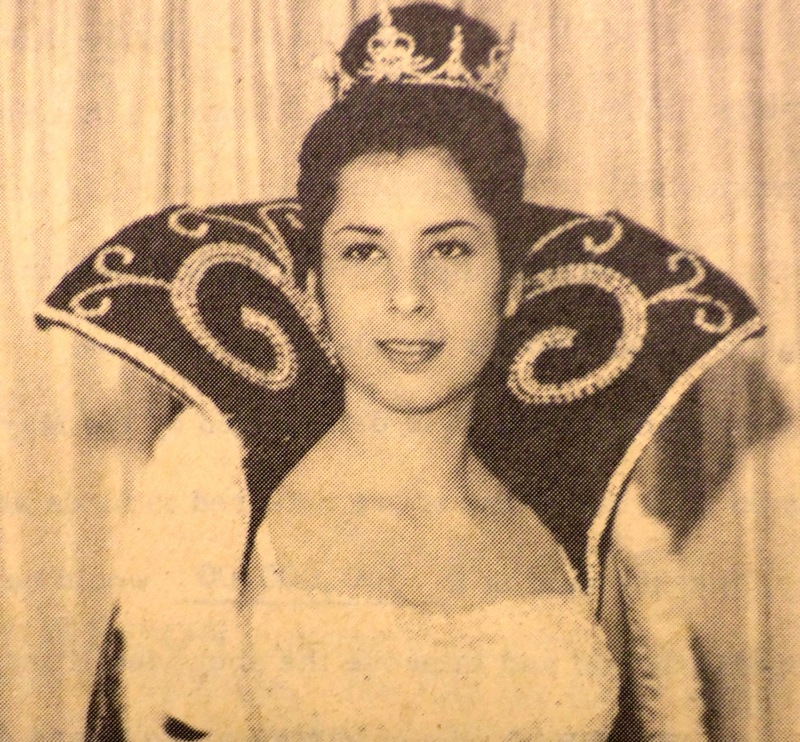 and Evelyn E. Desporte Thompson (1904-1986) ruled the Biloxi Mardi Gras on February 8th. 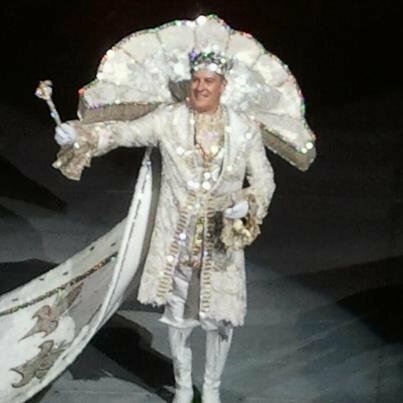 Dr. Albert Brown Russ and Josephine Folkes [m. Albert Brown Russ and Thomas Burns] were King and Queen of the Biloxi Mardi Gras on February 24th. John Wright Apperson and Mildred Eley (1902-1992) ruled on March 1, 1927. Mildred was the daughter of Dr. William W. Eley (1875-1944) and Florence Keahey (1874-1948). She married Frank Kennedy. Dr. Eley was a general medical practitioner and the family resided on West Beach. Her siblings were: Clifton C. Eley (1905); and Eugenia F. Eley (1910). Antonio J. Catchot (1864-1954) of Ocean Springsand Pearl Lee Atkinson [m. Louis J. Gutierrez] ruled the 1929 Biloxi Mardi Gras. Antonio J. Catchot, called Captain Tony, was born on January 29, 2864 at Ocean Springs, Mississippi to Jose' Catchot (1823-1900), a native of Minorca in the Balearic Islands off the eastern coast of Spain, and Julia A. Smith (1823-1903), an 1847 immigrant from Limerick, Ireland, and the widow of John Hays. On October 1, 1882, Tony Catchot joined the L&N Railroad. A.J. Catchot's engineering abilities were so impressive that in October 1894, he was sent to Pensacola, Florida to assist in building the Muscogee wharf, the docks at Commandancia and Tarrangona Street, and a coaling station for U.S. Steel. In 1900, the L&N loaned him to the U.S. Navy to rebuild the docks at Warrington, Florida. He then went to the Dry Tortugas to construct wharves and a condensing plant. Catchot was also loaned to the Gulf & Ship Island Railroad to erect the piers at Gulfport in 1901. Tony Catchot returned to the L&N Railroad in 1902, and was promoted to Superintendent of the Bridge and Building Department of the New Orleans-Mobile Division in 1907. He remained as this prestigious post until 1943. A.J. Catchot had bought the old Louis Darring property on the southeast corner of Washington and Desoto in 1897. He built a new structure here commencing in February 1897. It served as a saloon until it closed in April 1899, leaving George Arndt's Paragon Saloon the only one in town. Catchot later rented the structure to various merchants. Through the years many honors and awards were bestowed upon Captain Catchot. 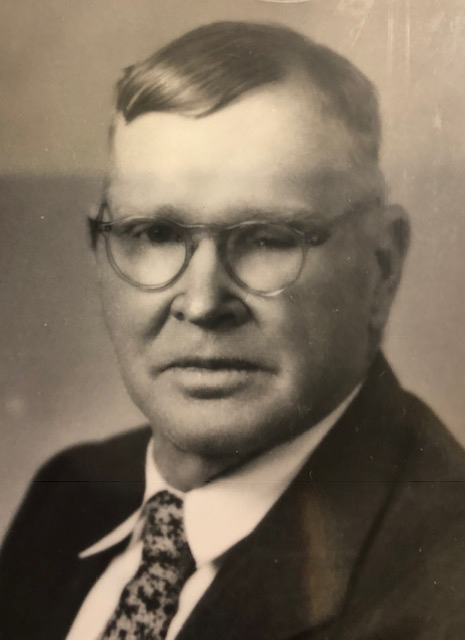 He was a board member of the Farmers and Merchants State Bank in 1915, and elected president of the bank in September 1925. In May 1925, Catchot formed the Superior Oil Company of Ocean Springs with J.J. Kennedy and F.B. Royster. The purpose of this $15,000 capitalized company was to market gasoline and oil in the area. Tony Catchot was elected president of the L&N Veterans Club for the New Orleans- Mobile Division in the late 1920s. 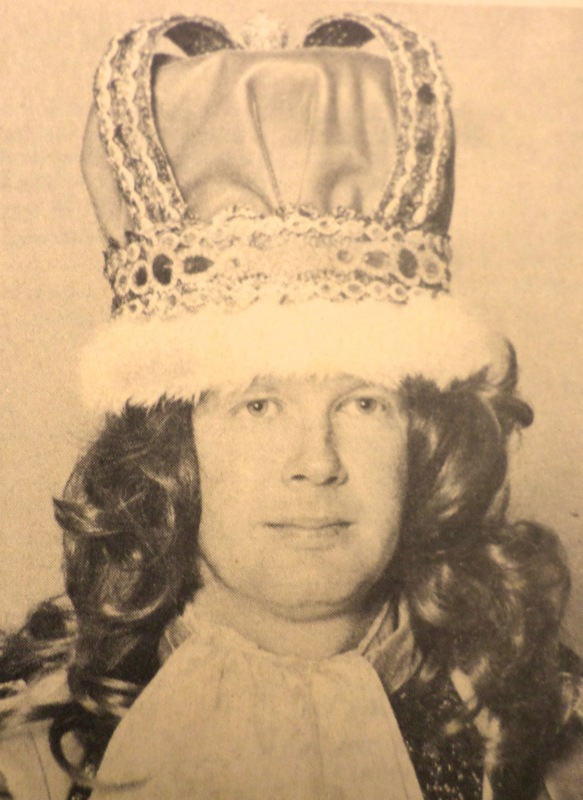 In 1929, he reigned as King d'Iberville of the Coast Mardi Gras Association. Catchot was a charter member of the Ocean Springs Fire Company No. 1 joining in 1880, and serving as its fire chief for nearly sixty years. Antonio John Catchot retired from the L&N on January 1, 1947, after sixty-four years of loyal and meritorious service to that organization. He died on August 11, 1954, at Handsboro, Mississippi. Catchot's remains were interred at the Evergreen Cemetery on Fort Bayou. Clark C. Griffith and Katherine Weeks. John E. Dunnavant and Betty Grayson [2nd Junior Carnival] on February 29th. Mardi Gras on February 6th. WWII no celebration. Mardi Grad on March 9th. WWII no celebration. Mardi Gras on February 22nd. WWII no celebration. Mardi Grad on February 13th. Jesse Smith, King d'Iberville and Natalie Thiac. Mardi Gras on February 18th. Harry Johnson Schmidt, MD (1905-1997) and Ella Mae Barq on February 21st. Edward Barq Jr. (1921-1971) and Bessie Marie Corso [m. ] on February 17th. 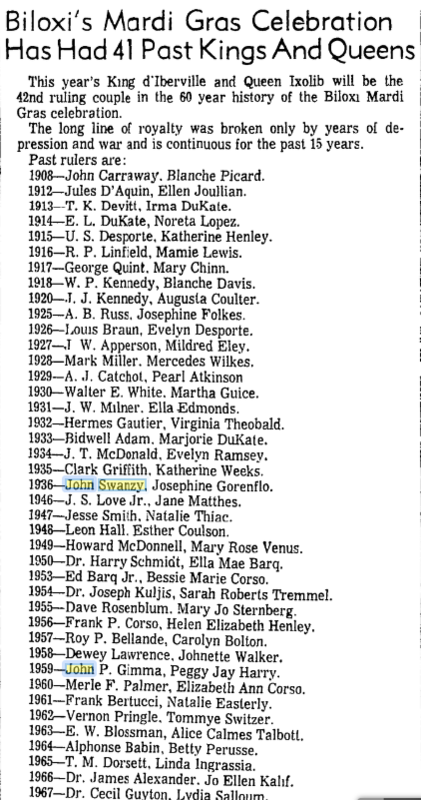 Jack Thompson, son of Hollis C. ‘Tommy’ Thompson and Evelyn Desporte Thompson (1904-1986), Queen Ixolib of 1915. Mardi Grad day February 7th. Mardi Grad on February 5th. Mardi Gras on February 24th. Mardi Gras on February 16th. Mardi Gras on March 8th. Mardi Gras was on Februay 12th. Mardi Gras on March 4th. Mardi Gras on February 9th. Mardi Gras on March 5th. The Biloxi Herald, “Death of Bernard Picard”, May 23, 1896. The Daily Biloxi Herald, “”, . The Biloxi Daily Herald, “Biloxi Mardi Gras now a certainty”, February 29, 1908. The Biloxi Daily Herald, “Biloxi first Carnival a success beyond expectations”, March 4, 1908. The Biloxi Daily Herald, “Story of the Big Parade”, March 4, 1908. The Daily Picayune, “Mardi Gras at Biloxi”, March 4, 1908. The Biloxi Daily Herald, “City News”, August 14, 1908. The Biloxi Daily Herald, “Levy-Picard”, August 27, 1908. The Daily Herald, “Chiapella gets title from King”, February 21, 1912. The Daily Herald, “Most auspicious Mardi Gras in Biloxi’s history today”, February 16, 1915. The Daily Herald, “ ”, February 17, 1915. The Daily Herald, “Carnival plans start last night”, January 13, 1917. The Daily Herald, “Blakeslee assure Carnival success”, January 23, 1917. The Daily Herald, “Spectacular scenes mark the close of Gulf Coast’s greatest Carnival”, February 21, 1917. The Daily Herald, “McColl-Henley”, February 11, 1918. The Daily Herald, “King and Queen of Mardi Gras to come to Biloxi shores”, February 11, 1918. The Daily Herald, “Elk's Ball is splendid”, February 12, 1918. The Daily Herald, “Rapid rise of former Biloxian”, September 24, 1918. The Daily Herald, “Thousands view spectacle of Biloxi’s Mardi Gras”, February 25, 1925. The Daily Herald, “Fifth annual Masques Ball [Les Masques] scene of exotic brilliance”, February 12, 1927. The Daily Herald, “Ocean Springs first to enter Mardi Gras", December 20, 1927. The Daily Herald, “King D'Iberville nears capital city”, February 1, 1929. The Daily Herald, “History of Biloxi Mardi Gras observance given”, February 17, 1931. The Daily Herald, “Iberville in Biloxi for annual visit, guns boom welcome”, February 9, 1932. The Daily Herald, “King and Queens of Past Years”, February 9, 1932. The Daily Herald, “Reign as King [Leslie B. Grant] and Queen [Vera Bond] of Les Masques at Biloxi”, February 15, 1933. The Daily Herald, “Biloxi enjoys festivities”, February 14, 1934. The Daily Herald, “Will announce Queen tonight”, February 13, 1934. The Daily Herald, “Zulu celebration held in Biloxi”, February 14, 1934. The Daily Herald, “Junior Carnival [Possum Neck neighborhood] parade”, February 15, 1934. The Daily Herald, “Mardi Gras tours”, February 15, 1934. The Daily Herald, “Reign as King and Queen of Carnival Ball at Biloxi [photo]”, February 16, 1934. The Daily Herald, “New Carnival organization”, January 7, 1936. The Daily Herald, "Miss [Josephine] Gorenflo Queen”, February 26, 1936. The Daily Herald, "Four more floats in Biloxi parade”, February 24, 1938. The Daily Herald, “Martha Burnett and Carl Winecoff rule Billikins”, February 8, 1941. The Daily Herald, “Miss [Laurie] Wilkes and Alf Dantzler rule [Les Masques]”, February 15, 1941. The Daily Herald, “Captain Dewey Reagan and Mrs. F.S. Eastland rule ball [Mithras]”, February 22, 1941. The Daily Herald, “Colored Carnival Parade at Biloxi”, February 23, 1941. The Daily Herald, “Colored Carnival Parade is planned”, February 24, 1941. The Daily Herald, “Kiddies frolic for Mardi Gras at Biloxi”, February 25, 1941. The Daily Herald, “King d'Iberville arrives Tuesday on Barq Yacht", February 6, 1948. The Daily Herald, “Miss Matthes, Carl Winecoff Mithras rulers”, February 7, 1948. The Daily Herald, “Observed Carnival at Biloxi", February 11, 1948. The Daily Herald, “McDonnell, Miss Venus rule at Biloxi”, March 2, 1949. The Daily Herald, “”, , . The Daily Herald, “Elect Ed Barq Jr. president Biloxi Carnival group”, March 27, 1953. The Daily Herald, “King d'Iberville, Queen Ixolib rule Biloxi fete”, March 2, 1954. The Daily Herald, “Blossman head Coast Carnival organization”, January 3, 1964. The Daily Herald, “Reveal mysteries of Coast mardi Gras”, March 1, 1965. The Daily Herald, “1965 King d'Iberville is Dorsett”, March 2, 1965. The Daily Herald, “Queen is Miss Linda Ingrassi”, March 2, 1965. The Daily Herald, “T.M. 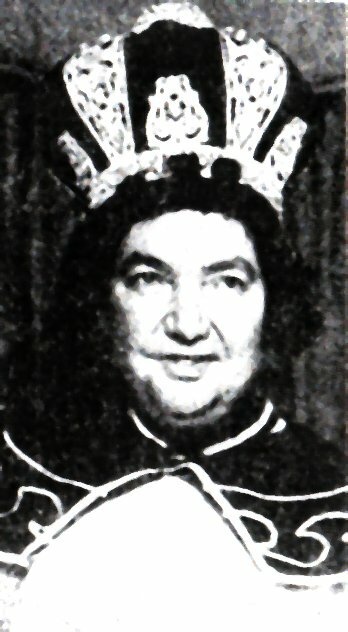 Dorsett, Miss Ingrassi rule Mardi Gras”, March 2, 1965. The Daily Herald, “Carnival is climaxed with Biloxi parade”, March 3, 1965. The Daily Herald, “Biloxi medals for Mardi Gras are being cast”, December 12, 1965. The Daily Herald, “1927 Queen Ixolib now resides in Long Beach”, February 3, 1966. The Times-Picayune, “The Roll of Rex”, February 20, 1966. The Daily Herald, “Biloxi Carnival Clubs look ahead to new themes for 1967 tableaux”, February 21, 1966. The Daily Herald, “Dr. Alexander is d’Iberville; Miss Kalif is Ixolib”, February 22, 1966.. The Daily Herald, “Thompson family reigns again in Biloxi”, February 6, 1978. The Sun Herald, “”, , . The Sun Herald, “Mark Mavar is King dIberville”, February 19, 2012, p. F1. The Court: King Aurguis I; W.S. McIntyre; W.J. Thomas; W.H. Hunt; P.H. Prieur; John F. Eistetter; and Charles M. lanius.